Web Hosting UK offers WordPress and Magento-specific hosting plans as well as VPS plans with enough power for e-commerce stores. The lack of a free SSL certificate is a downside for e-commerce websites, but isn't enough of a downside to keep this from being an excellent overall option for any webmaster. Web Hosting UK is a privately-owned web hosting company founded in 2001. Today, it serves more than 35,000 customers and 1,000,000 websites, making it one of the largest providers in the country. Support is available in English. 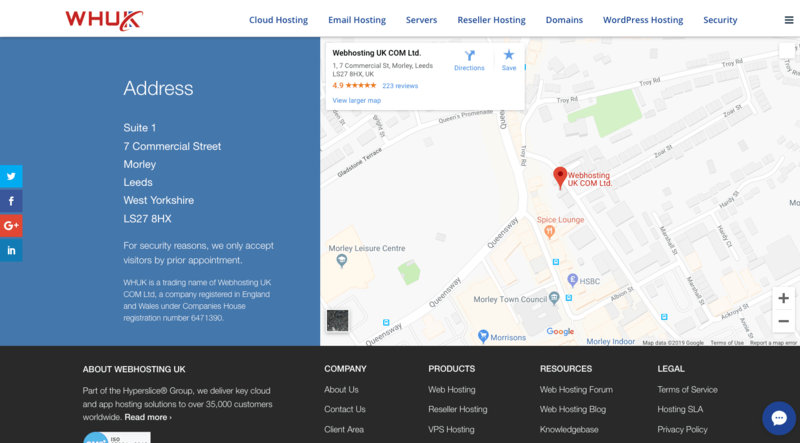 All of Web Hosting UK’s shared Linux and Windows web hosting plans come with a 99.9% uptime SLA, a free domain name (for yearly plans), and a one-click installer for hundreds of popular applications including WordPress, Drupal, Magento, and Joomla. Unfortunately, you’ll have to purchase SSL certificates separately. WordPress webmasters can also take advantage of plans for their specific needs. Beginners will find the most value here in comparison to the regular hosting options. Themes and plugins come preinstalled, WordPress-specific firewalls are provided, and updates are installed automatically. These provide value to webmasters who want to create quality websites but not be bogged down in technical details. Another way Web Hosting UK stands out is in its provision of Magento-specific plans. These plans allow e-commerce merchants to benefit from additional security features including protection from malware, viruses, and DDoS attacks targeting the platform. They also help ensure PCI compliance. In addition, they all come with SSD and scalable RAM/CPU performance upgrades, so website speed remains high even as you grow. VPS plans are available as well. Here, Web Hosting UK stands out by offering webmasters lots of freedom in choosing how to configure their websites and servers. Full root access is provided, and the advanced Perl programming language gives webmasters the ability to customize as they see fit. Web Hosting UK offers low-cost shared hosting plans with excellent value. The entry-level plan comes packed with features and a free domain name but still costs roughly the same as similar plans offered by the competition. The price-to-value ratio is extremely high, with a 2.5x increase in price getting you an eightfold increase in storage capacity. Given how much of the behind-the-scenes technical work Web Hosting UK takes care of, the WordPress-specific plans are relatively low-cost for beginning webmasters. Medium-sized websites are Web Hosting UK’s sweet spot — the good mix of overall storage capacity, bandwidth, and number of websites supported means both individual websites and networks will find value here. The highest tier cloud cPanel plan is the weakest: despite good performance specs, it comes with a 40GB storage cap that will be too small for larger e-commerce stores. There are four VPS hosting plans offered, and all come with a 30-day money back guarantee with no minimum contracts. The lower tiers offer an excellent ratio of performance (two vCPU cores) to capacity (30GB SSD). Unfortunately, the value drops off a little bit by the higher tiers, with just six CPU cores (a threefold increase) offered to handle 240GB of storage (a near tenfold increase). Still, the balance is better than what you will find offered by many other competitors. Support is available 24/7 in U.K. English and is excellent. You can reach a representative and get immediate assistance via phone and live chat. 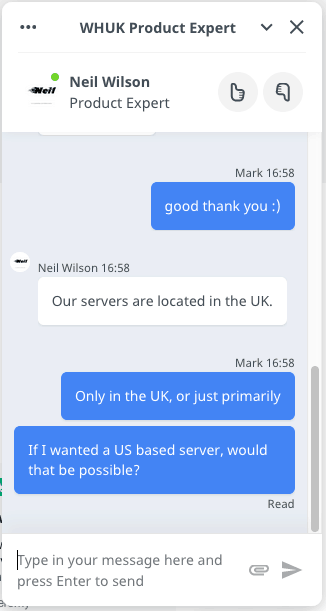 As you can see, support is professional and responded very quickly — once I accessed the live chat, I was connected with a real agent almost immediately. Email and ticket support are also available. Alternatively, there’s a huge self-help database available that can provide answers to the most commonly asked technical support questions. 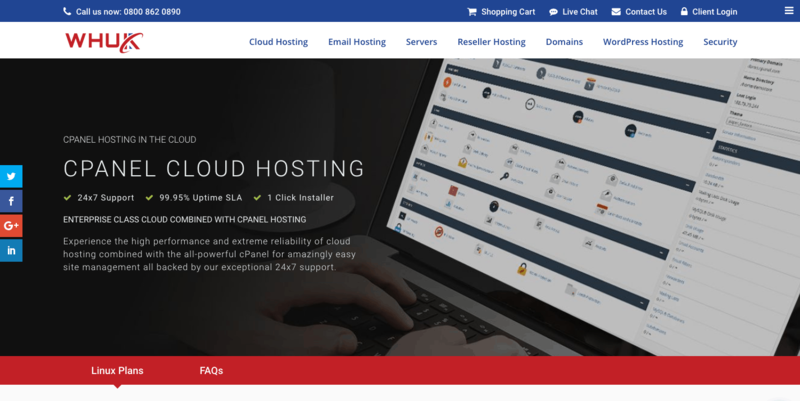 Webhosting UK offers excellent functionality including SSD storage, cPanel/Plesk, and a free domain name for yearly plans. The ratio of speed to capacity tapers off as you get to the higher tier pricing, but there is still enough here to make it a good choice for all kinds of webmasters to consider.